Premier Grand Junction hotel invites guests and locals to indulge in a gourmet Thanksgiving Buffet without the hassle of cleaning dishes this November. DoubleTree by Hilton Grand Junction invites guests and locals to enjoy a Thanksgiving dinner without the hassle of doing dishes, leaving more time for family and friends. Guests will enjoy a salad station, an appetizer station, a carving station, entrées and vegetables, seafood, an omelet station, breakfast station and dessert station. Guests will be able to enjoy favorites such as a delicious roasted turkey, roasted garlic mashed potatoes, green bean casserole, as well as, steamed shrimp, imported cheeses, bacon and an assortment of cakes and pies. The buffet begins at 11 am and ends at 3 pm on Thanksgiving Day, Thursday, November 24th, 2016. The buffet is $30.95 per person, $14.95 for children 6 to 12 years old, with children five and under free. The buffet is currently sold out, however, the hotel is taking walk-ins for the buffet. 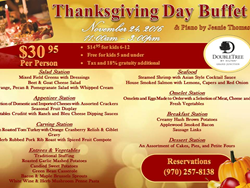 For more information or to book your Thanksgiving reservation, please call (970) 257-8138. DoubleTree by Hilton Grand Junction welcomes guests to step into a resort-style paradise at a premier upscale Grand Junction hotel. Minutes from Grand Junction Regional Airport, just off I-70, with beautiful views of the lush valley and famous bluffs of the Grand Mesa Plateau, DoubleTree by Hilton Grand Junction offers plentiful amenities, free Wi-Fi, delicious cookies upon check in and much more.